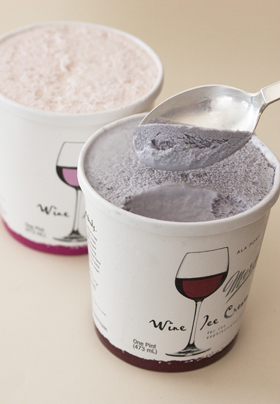 Wine Ice Cream? Yes, please! Why didn’t I know about this sooner? Anyway, apparently this is not available everywhere, only in a few places. Yes, they do ship, but it’s a bit pricey then. However, I’m hopeful they’ll start selling this in more places very soon. Hopefully close to where I live; that’d be awesome. Cherry Merlot: Mercer’s premium ice cream with Bordeaux cherries blended with a Merlot wine recognized for its plum and black cherry undertones. Chocolate Cabernet: Mercer’s premium chocolate ice cream with bits of bittersweet chocolate blended with a Cabernet wine filled with dried cherry & cassis notes. Peach White Zinfandel: Mercer’s premium ice cream with fresh peaches blended with a White Zinfandel wine distinguished for its fruity undertones and pleasant finish. Port: Mercer’s premium ice cream blended with an award-winning Ruby Port wine appreciated for its rich, heavily-bodied flavor. Red Raspberry Chardonnay: Mercer’s premium ice cream blended with raspberry sauce and a Chardonnay wine known for its delicate vanilla nose and buttery smooth taste. Riesling: Mercer’s premium ice cream blended with a Riesling wine prized for its fruity, crisp refreshing quality. I honestly can’t decide which one to try first. I just want to try them all. Have you tried them? Are they as delicious as they sound? If you don’t know where to find them, you can use this map provided by Mercer’s. And no, I don’t work for them, I’m not being paid to say any of this, I haven’t tried their ice cream (although I’d love to!) and had never even heard of them before (until today).